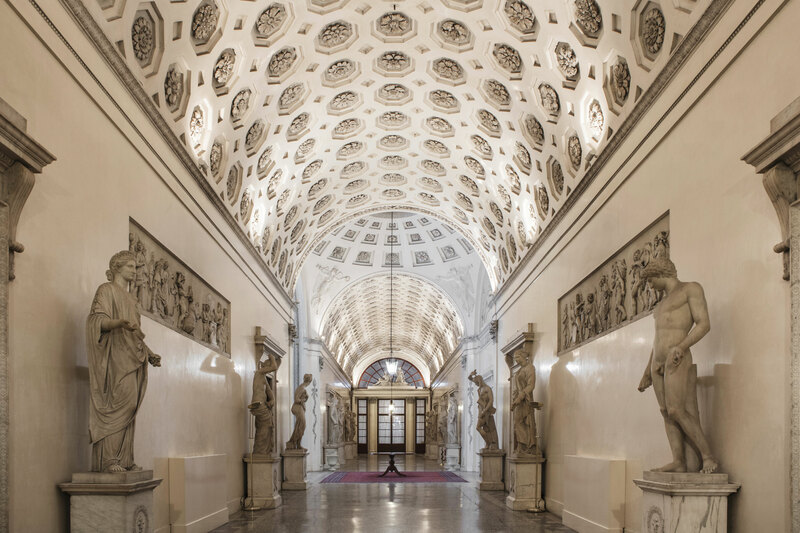 The architect Lorenzo Nottolini was commissioned by the Duchess of Lucca, Maria Luisa of Spain, to refurbish the corridor that connected the “Royal staircase” to the “Royal Apartments” turning it into a “Gallery”. The works of masonry started in the end of 1818, and were still in progress in February 1820, but probably this date marks their end. The stucco work of the Gallery, excluding the four panels on the walls, as well as the works of the lunette with the portrait of Maria Luisa and those of the two sculptural groups above the portals, were entrusted to the plasterers Pauli and Guidotti, with a laboratory based in Florence. However, the artist responsible for what we consider to be the mayor decoration of the Gallery, was only one skilled and refined sculptor: Salvatore Bongiovanni, professor of sculpture at the Academy of Florence. Two themes are fundamental in the representations. In the lunette below the dome there is another celebratory motif of the duchess, whose effigy is supported by the figures of Minerva, of Fame, and Genius of Abundance; at one side the three Arts and on the other side Mercury and the personification of Agriculture are portrayed. The other artworks by Bongiovanni in the Gallery are related to the Myth of Hercules. The wall bas reliefs depict two of the legendary labors as well as two other ventures of the hero: ‘’Hercules brings the living Erymanthian boar to Eurystheus” and “Hercules freeing Alcestis from Hades”. The latter shows the demigod fighting against the Furies. In the two sculptural groups on the portals Hercules and Omphale are depicted and “Hercules deified by Hebe”. It is not easy to establish who supplied the project of Bongiovanni’s sculptures; probably it was the court poetess Teresa Bandettini, who had composed poems on Hercules’ adventures. The bucolic choice of two marble sculptures can be attributed to the poetess: “Cyparissus while invoking Apollo’s death” and “Silvia asking for revenge for the deer killed by Ascanio” both of them are placed at the centre of the gallery in the so-called “Temple of Bacchus”, frescoed by Bargioni. The Aeneid is therefore once again a source of inspiration for the decoration, not only sculptural, but also of the frescoes in the dining room with stories from Virgil’s poem.